Educator needs to compose and provide background information on topic/concepts. The building shown is at the University of Nebraska - educator could discuss how similar or different their school's latitude is for comparative purposes. 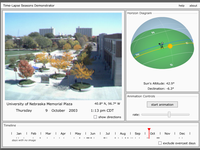 The University of Nebraska-Lincoln has created this time-lapse seasons demonstrator. Images were obtained at noon - students can record various observations from this series of images and predict how the sun changes over time. Comments from expert scientist: Strong visualization of solar altitude and declination with clear, consistent images matching sun location, date, and time. There is some support for educator teaching this concept (help tab on animation). MS-ESS1.B2:This model of the solar system can explain eclipses of the sun and the moon. Earth’s spin axis is fixed in direction over the short-term but tilted relative to its orbit around the sun. The seasons are a result of that tilt and are caused by the differential intensity of sunlight on different areas of Earth across the year. MS-P1.1:Ask questions that arise from careful observation of phenomena, models, or unexpected results, to clarify and/or seek additional information. MS-P4.1:Construct, analyze, and/or interpret graphical displays of data and/or large data sets to identify linear and nonlinear relationships.